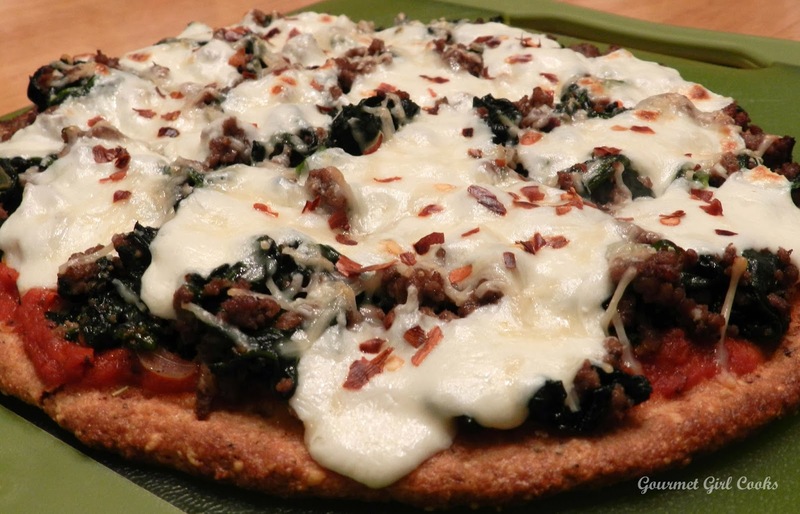 Gourmet Girl Cooks: Pizza Crust -- Wheat-free & Low Carb...& Delicious! Oh, my goodness, you have to hear this! I was making your crust again over the weekend. It's a staple at our house. I got distracted, and I also didn't have my glasses on. When I returned to measuring the flax seed meal, I put in 1 cup instead of 1/4 cup! When I realized it, it was too late. So I thought, what do I have to lose? I spread it and baked as usual. It still worked, even though it was firmer. And now the pizza is a delicious memory. I prefer the original, but we could even eat a mistake! Hi GG, I hope that you are alright! First I thought that you may have won the *Powerball* since 1 winner was from Atlanta Georgia. !LOL! Now I am worried. I just hope that you are busy with Christmas and nothing else! Please let me know that you are fine! Barbara from California. How nice that you were able to make your own pizza and join in with your co-workers! I know what it's like being the only one not eating the "usual" party foods. None of my co-workers are interested in changing their eating style, tho, beyond showing a little curiosity and then the comment about not being able to live without bread/pasta etc. Maybe someday I'll help convert someone, I hope! I think I'll make your pizza for a simple Xmas Eve dinner! Happy Holidays! Hi GG, I am glad that you are fine!!!!. I am off to the mountains but do not want to leave before wishing you a Merry Christmas and a Happy and Healthy New Year, Barbara. Just now I am making your Pecan Pie. The *Boyajian Maple Flavor*is fantastique! Thank you for all the nice recipes!